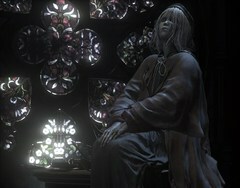 The Painter, or the Lady of the Painting, appears in the Painting of Ariandel and is seeking to paint a dark and cold world that will make someone a goodly home. She is locked in the upper floor of the library at the end of the Corvian Settlement. Guarded by Sir Vilhelm, he must be defeated to obtain the key that unlocks the staircase to her location. After freeing her from the library, she'll move to the attic in Ariandel Chapel.